Its getting close. I stole an idea from a fellow blogger NigelisinJapan check him out. Normally I put the song at the end for you to listen to. But here is something for while you read. Or maybe it will make it difficult to read I don’t know. So I’ve got about 36 hours until I leave. At 10:50AM Central time Tuesday I’ll be on a plane to Tokyo. Then I’ll be in Nagoya by 6PM Wednesday. So I’ll be doing a bit of time traveling. Over a 14 hour flight I’ll gain 14 hours through the time zones and end up a day ahead. During my two hour layover in Tokyo I’ll be taking care of my immigration paper work and my customs paperwork. So I won’t have any time to look around unfortunately. I’ll have to come back to tokyo another time to visit. Then I’ll hop another plane for about an hour and a half to Nagoya. Where I’ll wait for my company to pick me up. Apparently I’ll be waiting with two other teachers. So thats pretty cool. I’ll get a chance to meet and get to know a couple of others. Anyway I need to get off to bed. I’m still up writing these things when I should be off doing something else. I’ve still managed to procrastinate to the max. Moving to Japan hasn’t changed that much of me… Maybe living there will. I guess we’ll see. I found out my placement Saturday. I’ve been a little crazy since then. At the time I was on my way to pick up a rental car. Then I took a nap and drove from my home town of Eunice, LA to Nashville, TN. Approximately 15 hours of driving overall. But this morning I spent all of five minutes in the consulate to turn in my paperwork and they said I could pick it up on Wednesday after 2 PM. BUT ya’ll didn’t come to hear about that. Ya’ll want to know about placement. Turns out I’ll be living in Nara-shi, Nara. So yea short and sweet. Now I’m headed to dinner with a friend in Nashville. Have a great night everyone. OK so I got my International Drivers Permit yesterday. But I left it at my mothers house so I don’t have it here to show you a scary picture proving that I can drive around the world now. I know…its most unfortunate. 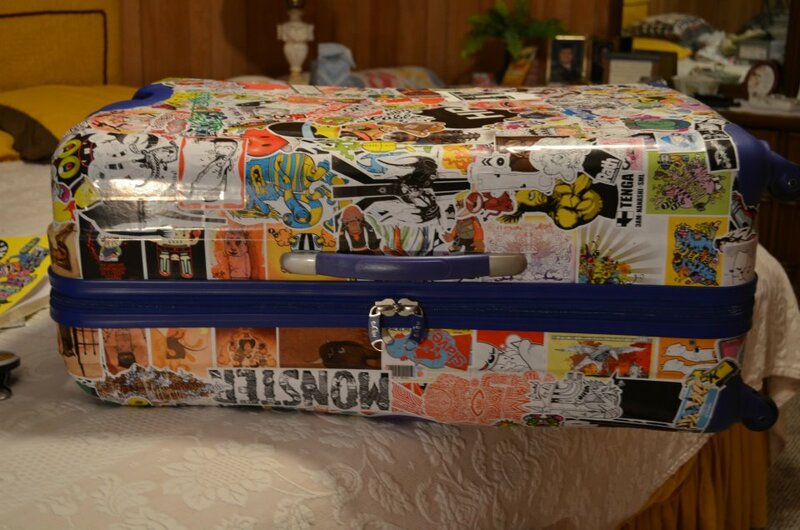 I did want to add a few photos because I just realized that I never put up photos of the finished product for my luggage project. So I’ll do that in a bit. Also I got a call my CoE paperwork should be here by Monday (hopefully sooner) and by Monday at the latest I’ll have a placement *excited*. I’ll have a whole post about that later though. 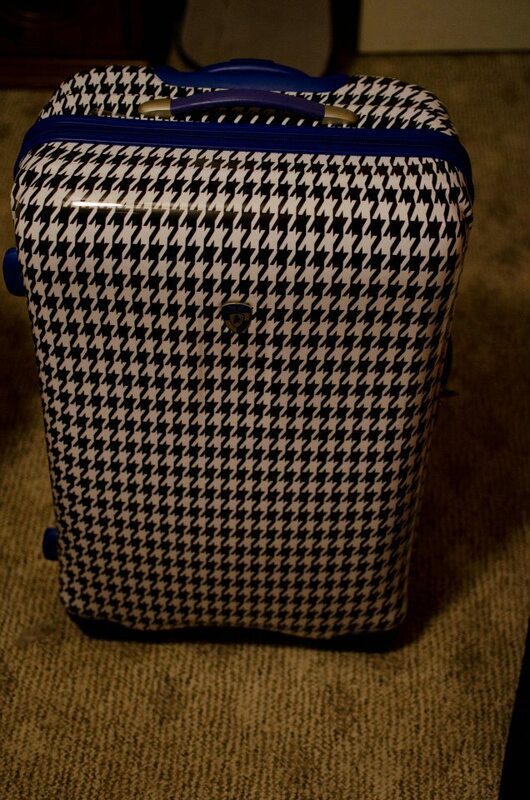 Heres the pictures of the luggage. 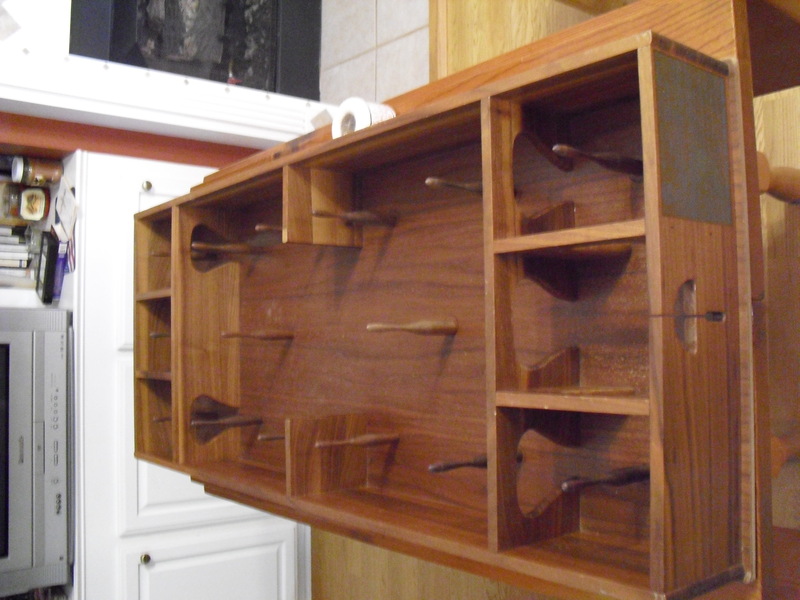 Theres alot more detail than you can really understand in pictures. 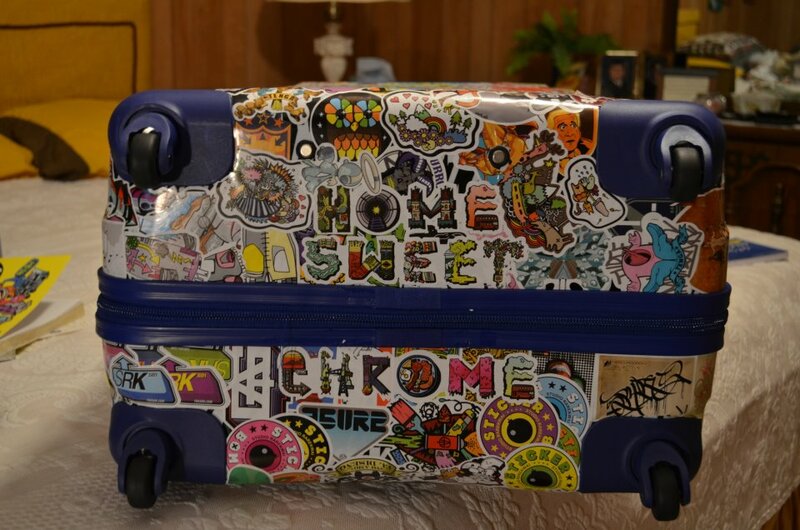 Its unfortunate that I put my favorite stickers here. I put them on first and then they were mostly covered. 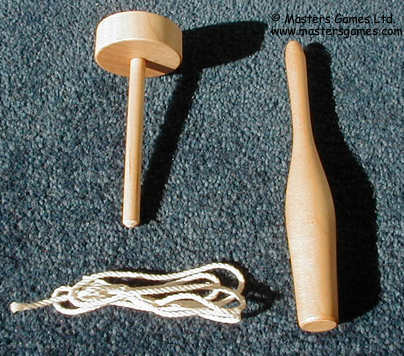 All spinners. So they should be easy to get through the airport. 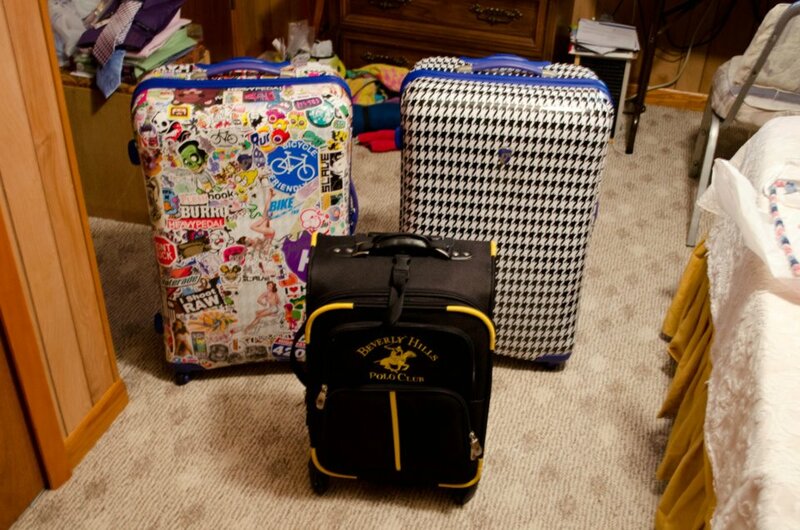 The biggest are 29" and the little carryon is 21"
So now I’ve got less than three weeks left until I leave. Of course when you look at it as 19 days it seems like alot longer. HAHA. I have a lot that I’m thankful for. So many things have just worked in the past year. Since I left school and went to work this time last year and set everything in motion to move to Japan I’ve been working towards this moment. God has been helping. I’m truly blessed, and in the past 6 months he has truly shown how he can work. The things that have just worked out can only have worked for a reason. Selling my car, getting the job, having a place to stay in L.A., my grandparents letting me stay with them, and now I’m supposed to be selling my P.C. tomorrow which will help take care of most of my plane ticket. Fingers crossed for that. Its been a wild ride but everything in its place. And I only look forward to more good things to come. I haven’t left a song in awhile so I’ll leave you with this one. Greetings everyone. Sorry for the lull in posts. Its been a little crazy the last couple of weeks. I’ve been sick and busy. But I’m on top of things. THREE WEEKS! That’s how long before I leave. Can you believe it? Well today’s Saturday still, and I don’t leave until a Tuesday. But its really coming fast. And still so much to do. I still have to go to Nashville, TN between now and then. Its taking so long for my CoE to come back. Its getting stressful, but I’m not letting it get to me. So to the topic at hand. The weather here has been fantastic. We’ve had a couple of rainy days but that has helped what I’m going to show you. About 2 miles from here is a very large patch of dew berries just off the road. I rode my bike out there with my Grandmother last week and we picked about 2 gallons worth. 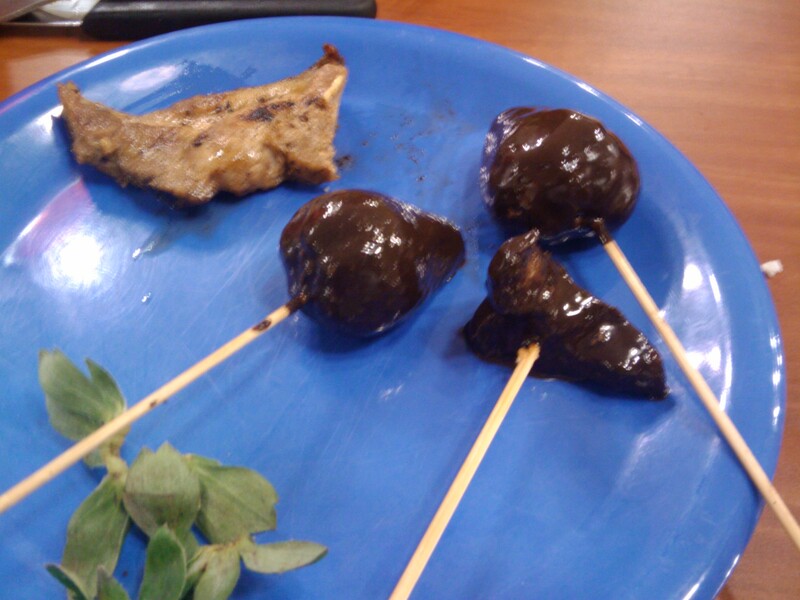 We ate them and used some to make a cobbler for my Grandfather’s birthday. I thought that it was so fantastic, and there were so many berries that I should take a few pictures and make a video as well. So we went back yesterday and picked two more gallons. So here is a video for you guys. I’ll be back soon with another video and another post that more well organized. Greetings everyone. Its been a bit since I’ve posted. I’ve been having a cold of sorts for about a week now and its going away now. I don’t usually get sick so when I do its a real pain. The worst part is I’ve been hoarse since last Friday because of a sinus drip. So to the point. Its April so I’ve got a month till I head out. Now before I wasn’t really in a hurry to leave, I had a lot to do before I left. The past two months however have been passing in a rush. Now though I’m ready to go. I want to leave as soon as possible. I’m not prepared to leave as far as paperwork is concerned, but mentally I’m prepared. Most of the paperwork requires waiting for other paperwork. So a lot of the preparation is a waiting game. My CoE should be back soon, then I’ll be off to Nashville to get my visa worked out at the Consulate. Also I’ve got to mail off the paperwork to Japan for my Yakkan Shoumei. Which is the paperwork that allows me to bring more than a months worth of medicine with me. I’ll make a blog post about it in a couple of days. In the mean time I have a video on my youtube channel ya’ll can watch if you like. I’ll be back with another update soon. I can see the light at the end of the tunnel. 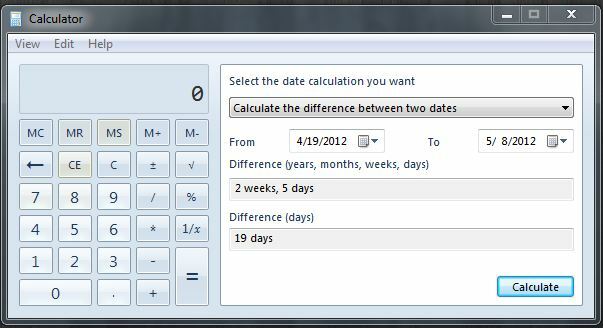 I realized that windows calculator has lots of nifty functions. 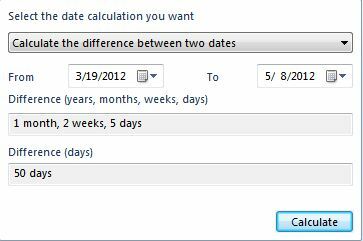 One of which can calculate the difference between dates. As in today’s date and when I depart for Japan. So I thought I’d just include that here. Now the real reason for this post is because I felt like I had been neglecting you guys. I apologize for that. I went to Lafayette for a week to do a little shopping. Try on some suits and see if I liked anything to shop for luggage and some other things. Alas the only things I came back with were the luggage and a new shirt. I’ll have to do better next time. 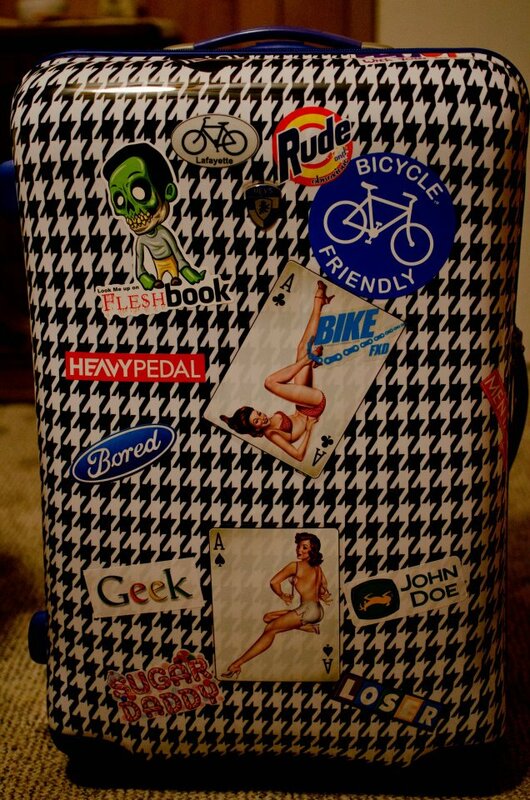 But here is a shot of the new luggage two Heys 29″ hardside spinners. So I have two of those. 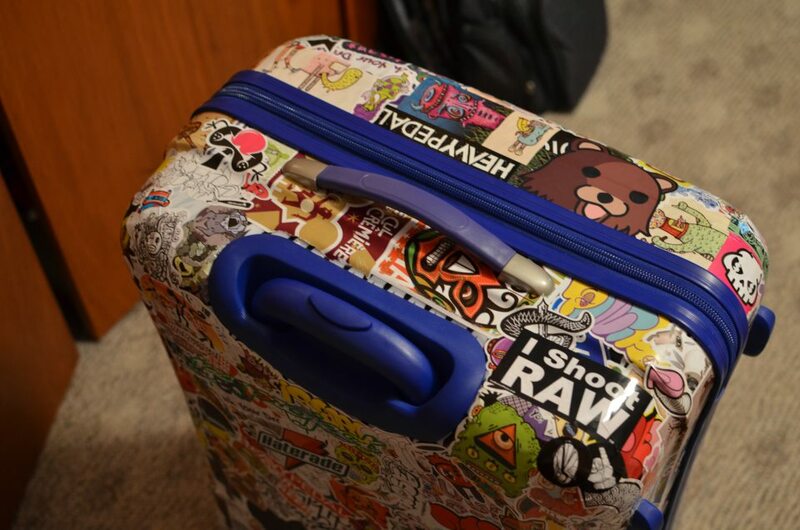 Shouldn’t be hard to recognize on the luggage claim belt. BUT one of them I am sticker bombing. 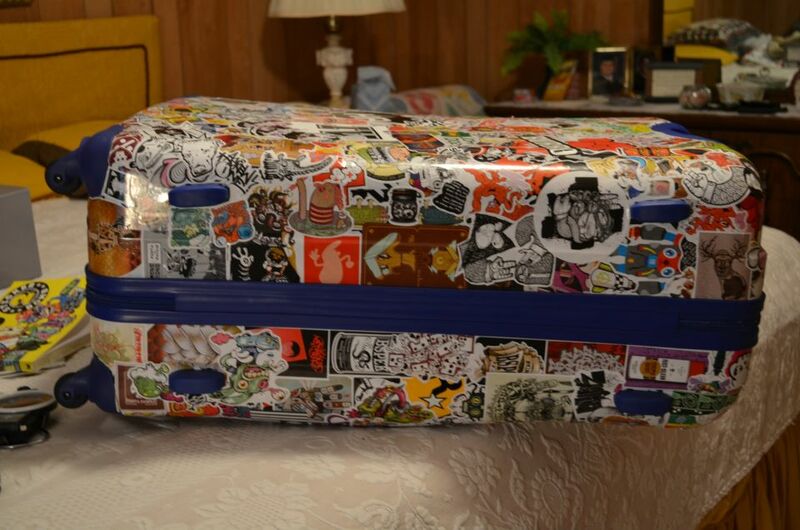 Which means I’m covering the whole thing in stickers that I’ve collected over the years. Well I ran out of stickers pretty quick. So I ordered some more and they’ll be in soon be here is what one side of it looks like right now. I had doubles of some stickers so I put them on the other side. Basically when I’m done you shouldn’t be able to tell that it was Hounds Tooth anymore. But it should look pretty awesome. 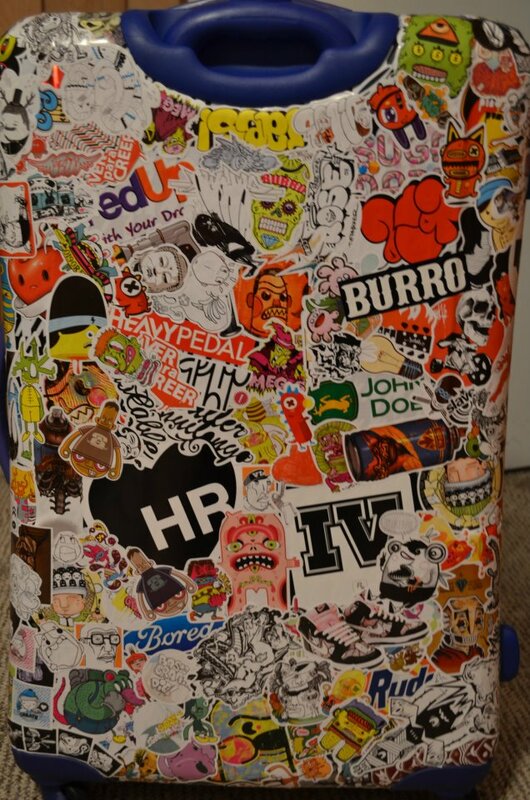 I wish I still had a few of my other stickers and hadn’t wasted them on my car or other places, oh well. I love stickers and I’ve picked them up in odd places over the years. I’ll post up a photo when its done too so ya’ll can have a better idea of what it supposed to look like. Hopefully I can also do a better prepping for Japan post too. Who knows maybe I’ll even do a post from Nashville. A quick new channel intro with the new camera. OK I know I said I would update the blog when I got back from Los Angeles but I’ve been busy/lazy. However I do have some new news as of this weekend. As some of you may know I have been volunteering for the past month teaching Sunday School at church to 5th and 6th grade. Also I’ve been working in the nursery with two through 5 year olds. After a month of this I got a recommendation from the nursery and the church for my contact at the company. And now as of Friday my paperwork has been sent to the office in Nagoya. Now I just have a two or three week wait while my paper work is looked at in the head office and decided on whether or not I should be hired. So now is the time for prayers. But I believe that everything has worked out according to a greater plan thus far in such a fantastic way that in can only continue to work out. Also I have a new camera a Nikon D5100 and it should be here Friday I believe. I also picked up a 35mm f1.8 lens. So soon I’ll have some nicer pictures and video for the blog and youtube channel. I’m looking forward to playing around with it this weekend. Thanks for following me everyone. Welcome to the new followers. So the family got together today for lunch and after lunch we broke out and old table top game. “Skittles” Well I’ve called it that for 25 years after a little research today I find out that might not be what its called. 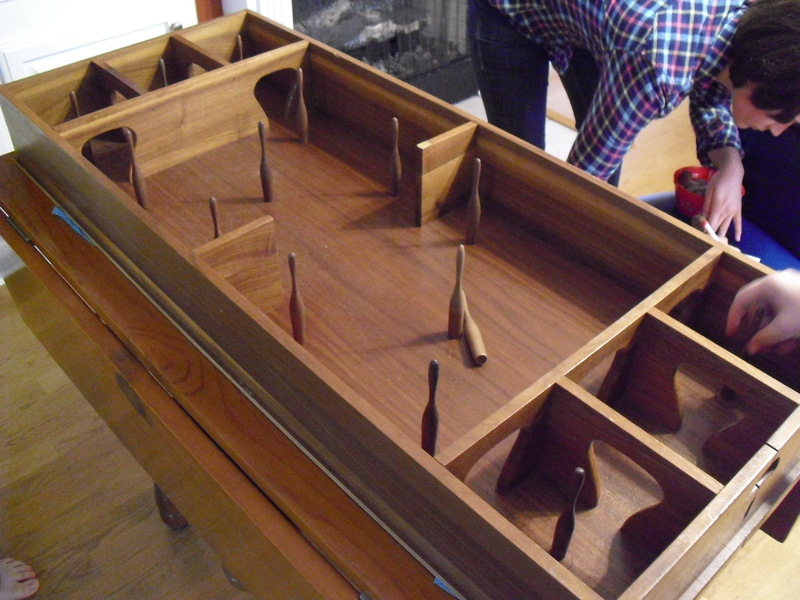 This game is thought to have been originally a Western European game – it’s still played in France and Benelux where it’s known as Table à Toupie and Toptafel, respectively. Nowadays, however, it seems to be more popular in North America where it’s usually called just ‘Skittles’. The idea is to spin a top into the game where it buzzes around the game surface and into the rooms. Points are scored AND deducted by knocking over skittles – whoever collects the most points wins! And a shot here from their website of a top and a skittle. 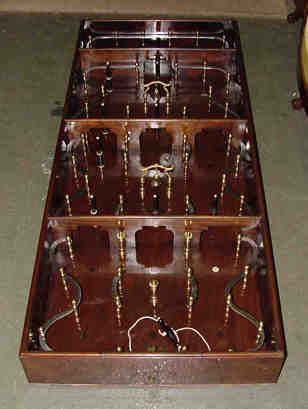 I also have a picture here from http://www.tradgames.org.uk that is thought to be a table made in 1820 and to have belonged to French royalty. Here’s a few shots I took of our table and the rule card thats on the front of the table. 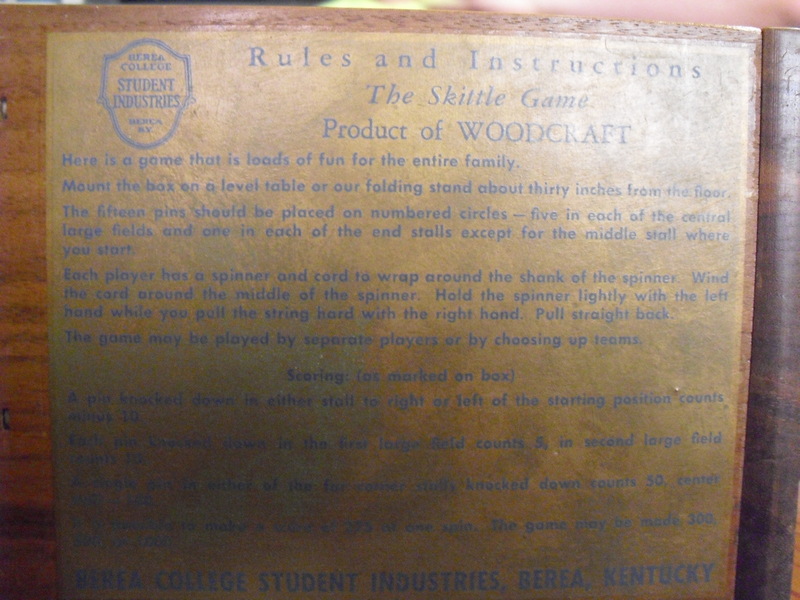 And then a shot of the card on the front of the rules. And then I managed to take some video of a few rounds being played. Then made a short video. So here it is.